For the next couple of days, I'll be posting some cards that I have received from other demonstrators in swaps I've been in. I was in a Holiday Mini swap recently, and I want to share some great card ideas that I received. For those of you that don't know what a swap is, I'll explain. This particular swap centered on Holiday Mini stamp sets and papers only. Everyone in the group picked out either a stamp set or the paper they wanted to feature on their card. Only one person per stamp set/paper in each group. Then, we each made one card using the item we chose. Then we counted how many were in the group and made that many of the card we created. When I finished mine, I sent them to the swap hostess, and she gave everyone in the group one of my cards. When she swapped out every one's cards, she sent them back to us. It's a great way to get samples for stamp sets that I don't own. I also have a local swap group that I've been swapping with for a few years now, and it's pretty much the same thing, but we usually try to get together by going out to eat. These ladies are very talented! I've received many ideas from them. We've become very good friends, and I would have never met them if I hadn't become a demonstrator. Above are two stamp sets that are in the Holiday Mini. I own both of these stamp sets, and have posted a couple of my creations using them before. These two cards were from the Holiday Mini Swap that I did through the mail. 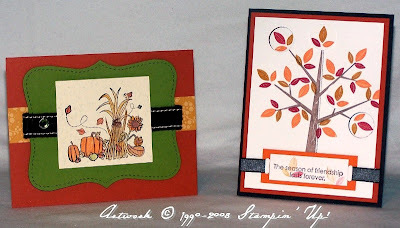 The left card uses Happy Blessings (p. 8 in the Mini), and was made by Holly Krautkremer. The one on the right uses Season of Friendship (p. 6 in the Mini), and was made by Kate Holland. I love both of these sets, and have already had a lot of fun with both of them. The Season of Friendship isn't just a fall set. It can be used all year around. Instead of the leaves, you can use snowflakes or flowers. There's even a bird that you can put in the tree! I've also made a scrapbook layout using this set, and you can find it HERE. There are also other scrapbook pages and projects that I made before starting my blog as well, if you haven't seen them before. NOV. 7, 6:00 - 9:00 P.M.